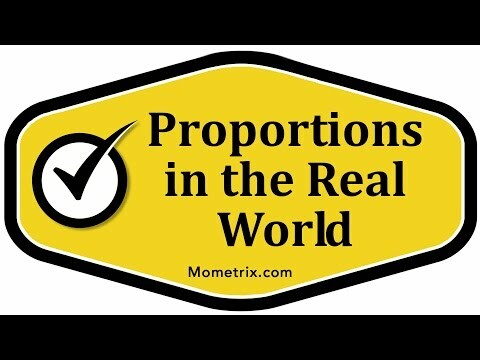 Proportions can be very helpful in solving many real-world problems. Just be sure that when you set up your proportion, you’re consistent in both your ratios. Let’s look at this problem. Suppose Hannah makes $10 per hour pulling weeds for a neighbor. How much money would she make if she were to work for 12 hours? What we’re trying to determine is how much money she would make if she worked in 12 hours. The information we already have is that she’s going to make $10 just by working one hour ($10 per hour). We can set up a proportion with the amount of money she makes divided by the time, or the hours, spent working. Again, we know that she makes $10 in one hour. As we set up our proportion, again, it’s very important to be consistent. If our first ratio, we’re going to put “dollars per hour”, then our other ratio needs to also be set up as “dollars per hour”. Since the money is what we don’t know, how much money would she earn, we don’t know the dollars. There, we can put a variable divided by, and then in 12 hours, so that’s our time. With both ratios, we’ve put our money divided by the time. Now that we’ve set up our proportion, we can solve it by using cross products, or just by cross multiplying. We’re going to multiply 1 times x, which is just x, equals 10 times 12 (120). Therefore, she would make $120 by working 12 hours.